How hard can it be to purchase Hammer products? Re: How hard can it be to purchase Hammer products? @HAXIT just to be clear, the sales and tech people were always clear about the 20 amp circuit. Some generic paper documentation said 30 amp in one place, and elsewhere said 20 amp. Interesting. Well that kinda makes me think they never intended it to draw over 20 amps, otherwise they might have used 10AWG wire. It really isn't about what Felder says at all and the fact it's wired with 12Ga, it's about what the Electrical code says in a individual's country. Like I said previously. If you have even a slight understanding of the Electrical code you will get the concept, it's not whether the machine will operate on a lower amp circuit it's about the safety aspect, especially in your home. As always do as you please. There was an interesting discussion on the first FOG about a member who also checked Felders electrical requirements before buying a widebelt sander and the power it was going to take to operate. He had the electrician wire what Felder said it needed and when the machine arrived and was hooked up, the amp draw of the machine far exceeded what they (the Felder Rocket Scientists) told the customer. Needless to say alot of problems and downtime for the guys business. He was unable to upgrade the circuit with the existing power on hand. Long story short, those same people are telling you to go against code. The happy ending is that because of the Felder BS they are taking back the machine and he's getting a unit that will work. I have a few Felder machines on order and will be wiring the shop in the next few weeks. Everything will be done with 10ga at a minimum. It's far easier to swap a breaker than it is to pull a new wire. I'd consider this option if you still can. I don't purport to know a lot about electrical stuff, especially 240v, but the issue as explained to me was that it would take an extra fraction of a second to trip the 30A breaker vs the 20A if the machine got overloaded and it could harm the motor slightly each time it happened. Since the thing runs fine on 20a, no reason to go higher. An electrical engineer on another site understood the issue but said it was a theoretical possibility and I'd probably get hit by a meteor before I managed to overload the machine enough to trip the 20 but not immediately trip the 30. That sounded right but I did the sub-panel anyway so as not to void the warranty if something bad happens. I just called Hammer's Delaware office five minutes ago and asked them again about the correct amp circuit for the A3 31. They again stated for a second time that 30 amps is preferred. All Hammer A3 31 specific documentation that I have seen says to use a 30 amp circuit. The technical support guy said that it might run ok on 20 amps but if your voltage drops at all the machine will draw higher amps and since start up uses close to 20 amps, it is better to go with a 30 amp circuit. What number or who did you call? I have called Hammer/Felder people too and gotten the "20A is what we recommend and have never heard of an issue". This is getting humorous. As I mentioned earlier Ive had my N4400 on a 20A circuit for over a year now and never had any kind of issue. 866-792-5288 is the number I called. Don't remember his name but I asked for technical support. I got voice mail and left a message. They called back within ten minutes. Maybe California is giving a different answer than Delaware or maybe the N4400 has different requirements than the A3 31? The plastic bag that comes with the machine and contains the hardware has a flyer that states: Maximum upstream protection not to exceed 20A at 3KW (S6-40%) 1 x 230V / 60Hz. That matched what the tech told me before delivery. There is another document that says to ensure the circuit does not have voltage fluctuations exceeding a specified percentage. I think it was plus or minus 10 percent. I think the EE's comment was that 30 amp should work fine, and I am sure that's right, but since the flyer specific to the machine as delivered and the Delaware tech both said to use a 20 amp circuit, I went with that. no problems running 12 inch hard maple workbench top through the planer. No, the Delaware tech told me today and 6 months ago (same answer 6 months apart) that a 30 amp circuit is preferred even though it may work on a 20 amp circuit. Which machine and motor? The manual says 20 amps for a three phase motor. The motor on my A3 31 is single phase. I did not have 240 volt service in my shop until recently. I could easily have put in a 20 or 30 amp circuit. A3-31, 4hp. I have residential single phase 240, 30A circuit, which is a dryer outlet with 4 10AWG wires that they put in the garage in case I buy an electric car at some point. my recollection is you just wire the same motor differently if you have something other than single phase. Did the 20A subpanel with 12AWG for the over current protection to the machine. It seemed complicated to me but made sense to the electrician. my guess is you are absolutely fine if your machine isn't tripping the breaker but you could do the subpanel with magnets like my electrician did if you have concerns. I am happy with my 30 amp circuit. The people using it on a 20 amp circuit are the ones that should be concerned. Could you post a picture of the flier that came with your machine? What year was your machine built? The year of manufacture is on the plate on the back of the machine. See my picture above. As long as the motor never draws over 20A (which if it did it would just pop the breaker) there is no cause for concern. If it is popping the breaker and its doing it regularly, then the circuit definitely needs to be bumped up to a 30 amp breaker with at least 10AWG wire. But so far I havent read to read or hear from anyone having issues with a Hammer 4HP motor tool on a 20amp breaker. Just a lot of people talking. And FWIW there is absolutely nothing wrong with putting the saw on a 30amp circuit if it makes one feel better. heck, you could put it on a 100amp circuit and as long as you gauge the wire correctly nothing will change. A system will pull only as much current as it needs unless there is a short or electrical failure of some other sort. Allowing the availability of more amperage does nothing but allow more current to be drawn. Maybe we should start a new thread, as I hate to hijack. But manufactured 2016, bought and delivered feb 2017. Let's see if I can post photo from iPhone. Circuit breakers are there to protect the wiring so that if there is a fault your building doesn't go up in smoke. If the saw is that critical as to the size of the CB then it should be built into the machine by the manufacturer and not left up to the discretion of the installer. Yours is same year as the machine I received. Don't remember seeing that document attached and I see that none of the boxes are checked on yours. Wonder if that means anything? And a pic of my Hammer N4400 plate stating 15A draw at 220V. After my experieces with them i would do all i could to avoid them. They really make it a buisness modle to pass the buck off on the consumer all the while with a smile on their face as though they are really trying to help. Does that trickle down to the Hammer stuff as well? I am still undecided in the two lines, but thought to ask. Yes. Hammer is a Felder line of machinery. Just like Lexus is part of Toyota. Or Acura is part of Honda. Or MiniMax is a part of SCMI. Or Powermatic is a part of Jet. Or with beer, many, many world famous brands are all owned by the same company. Miller and Coors are the same company now. But Bud and Miller were the same company for a short while. And Heineken is part of Bud now. And Fosters and Corona are owned by one of them too. In the US and Europe, a couple companies make all the name brand beers. They are sold and serviced by the exact same people. Hammer was recently purchased by Felder. 10+ years ago. In Europe maybe Hammer was a separate brand from Felder where they both operated as competitors for a few years. In the USA Hammer was never sold until after Felder bought the brand and introduced it to the USA. I had a chance to talk further about this subject with an inside salesperson who I work well with in the Toronto area at one of my preferred distributors. They tried bringing Hammer on for equipment sales and it didn't work out. I think the sales experience is extremely variable depending on your distributor with this brand. I see posts where people are completely satisfied and posts where people have had bad experiences (like Mine). In my case my Hammer F3 was shipped with plenty of handling scuffs and scrapes which to me was unacceptable. I also am not overly impressed with the micro adjust fence it comes with. It's a finicky and sticky fence setup which I just don't like. So far I can say that the Festool service model has been the best hands down of any product I have purchased. A very long warranty period, and if something goes wrong, all you have to do is enter the serial number and a waybill is generated, and it costs you nothing to send it away and have it shipped back. I have an A3-31 on the way from Texas, but I worked with Liz Rogers in California. She was more than helpful. We talked on the phone a few times and have exchanged several emails. She answered all of my questions. The machine should be here in a couple of weeks and in anticipation I asked her about the electrical requirements. And this is part of what she sent me. There has been a ton of debate over the years as to what wire and breaker size is required for this machine. What has worked for one person, does not work for others. Paperwork shipped with the machine sometimes doesn't match what the reps say. It's better to be safe than sorry, so my recommendation is to use 10G wire from the panel to the machine receptacle. Start with a 20A breaker. If it pops on startup or under heavy load, step up to a 30A. Way easier/cheaper to replace a breaker than to pull a new circuit. FWIW, before I moved my workshop from California to Louisiana, I successfully ran my A3/41 on a 20A breaker. Have the same setup waiting in Louisiana and certainly hope it works! It's not the size of the breaker but the curve that is important. Make sure that it is a D type breaker which is designed for much larger startup current pulses. "B curve breakers: Trip between 3-5 times rated current in a short circuit situation. B curve MCBs should be applied where loads are resistive and do not have in-rush current. The ideal application is lighting or electronic circuits. C curve breakers: Trip between 6-10 times rated current in a short circuit situation. C curve MCBs should be applied where the loads have a small amount of in-rush current on start-up. The ideal application is a circuit with a small transformer load. D curve breakers: Trip between 10-15 times rated current. D curve MCBs should be applied where loads have a high level of in-rush current on start-up. The ideal application is a circuit with a motor load." Im not sure we have such ratings in the USA for breakers. I cant seem to find any on my breakers from the manufacturers website and I have never heard of them before. 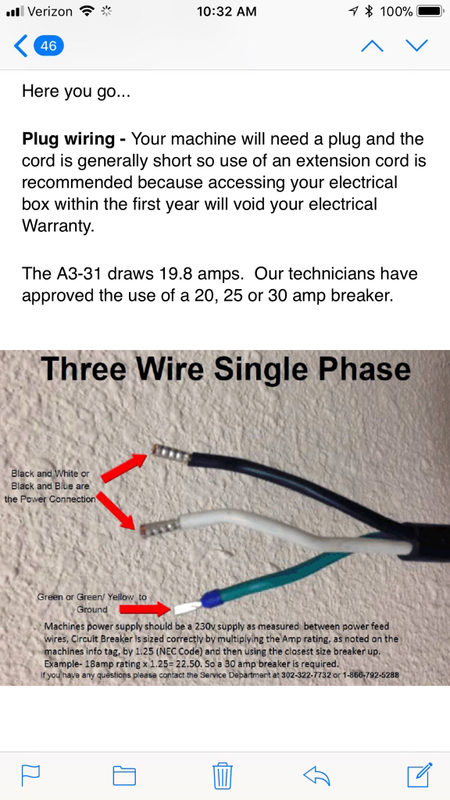 I just recently purchase a Hammer A3-26 jointer/planar and had my electrician install a 30 Amp breaker. From what I read in the instructions and online it made sense to go bigger at the start. As mentioned a 20 amp should be sufficient, but since I was using an electrician, we opted to go bigger and there was no cost difference. It will give me some growth capability should I get other Hammer machines in the future which so far I plan on at least the N4400 bandsaw. My thanks to all that respond to the questions on Hammer machines. At least this site is more informative than some other Felder/Hammer group sites. Also, I am learning something from the responses. Before buying an N4400, be sure to price a Felder FB510. I bought the 510 because at the time, it was only $600 more than the 4400. Any particular reason? I am just getting familiar with the Felder products so I could use the advice of woodworkers that use their equipment. Some people say that you have to get into the larger saws with 19" wheels and stronger frames before you can properly tension the wider blades used for resawing. It seemed to make sense to me for only a relatively small price difference.